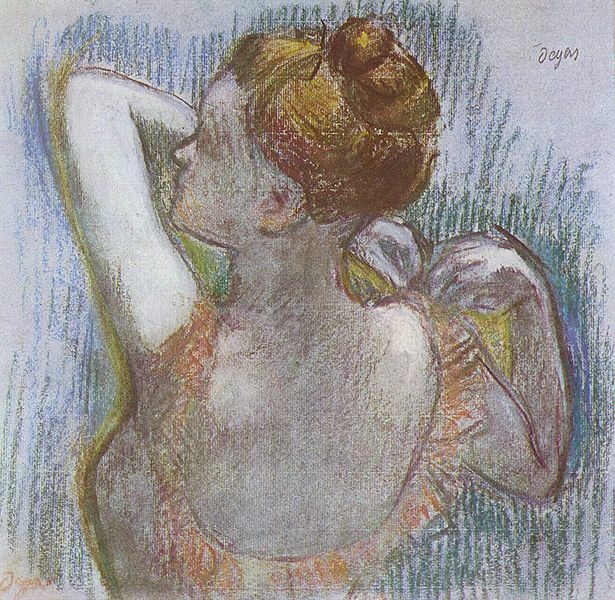 Pdgar Degas seems never to have reconciled himself to the label of "Impressionist", preferring to call himself a "Realist" or "Independent". 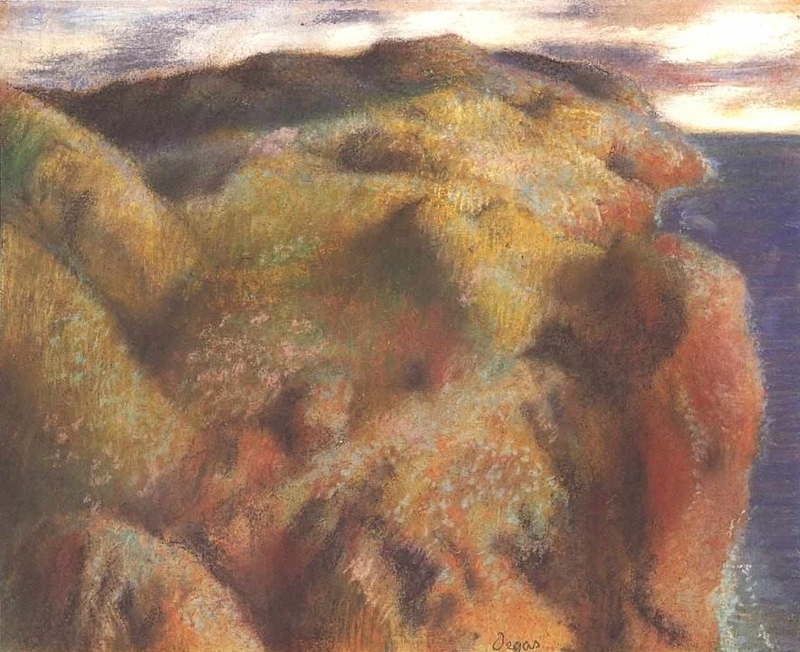 Nevertheless, he was one of the group’s founders, an organizer of its exhibitions, and one of its most important core members. 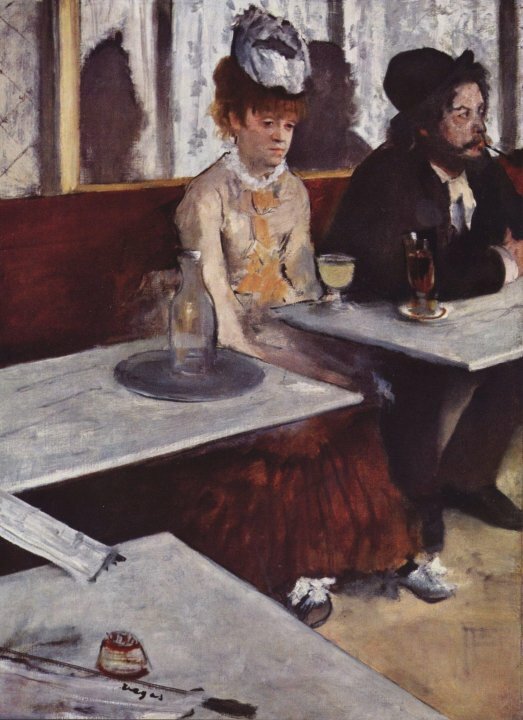 Like the Impressionists, he sought to capture fleeting moments in the flow of modern life, yet he showed little interest in painting plein air landscapes, favoring scenes in theaters and cafés illuminated by artificial light, which he used to clarify the contours of his figures, adhering to his Academic training. 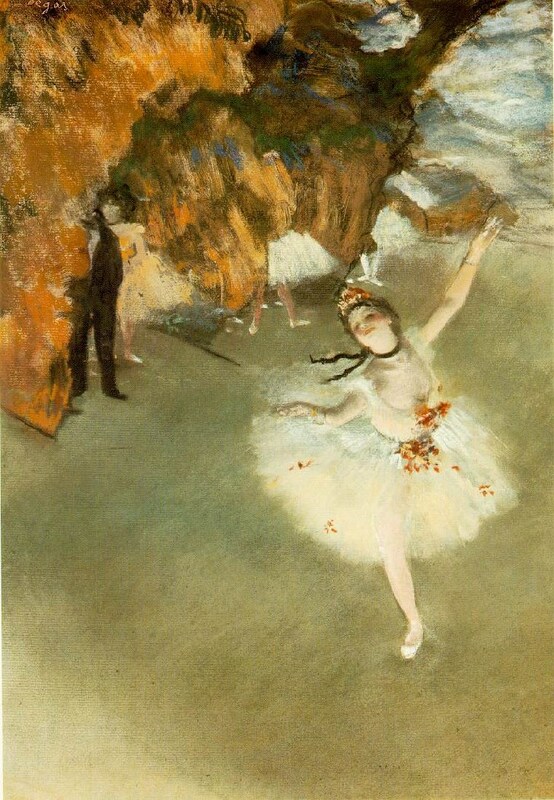 Evidence of Degas’s classical education can be seen in his relatively static, frieze-like early painting, Young Spartans Exercising (ca. 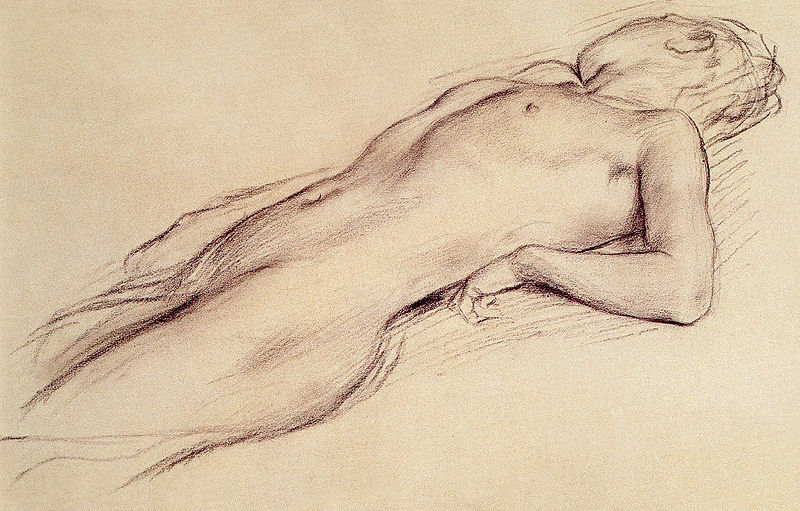 1860; National Gallery, London), done while he was still in his twenties. 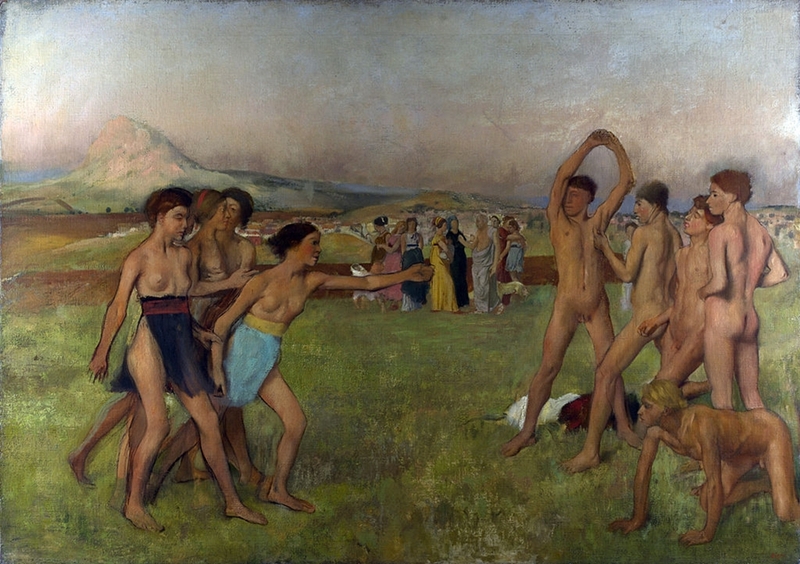 Yet despite the title, and the suggestion of classical drapery on some of the figures in the background, there is little that places the subject of this painting in ancient Greece. 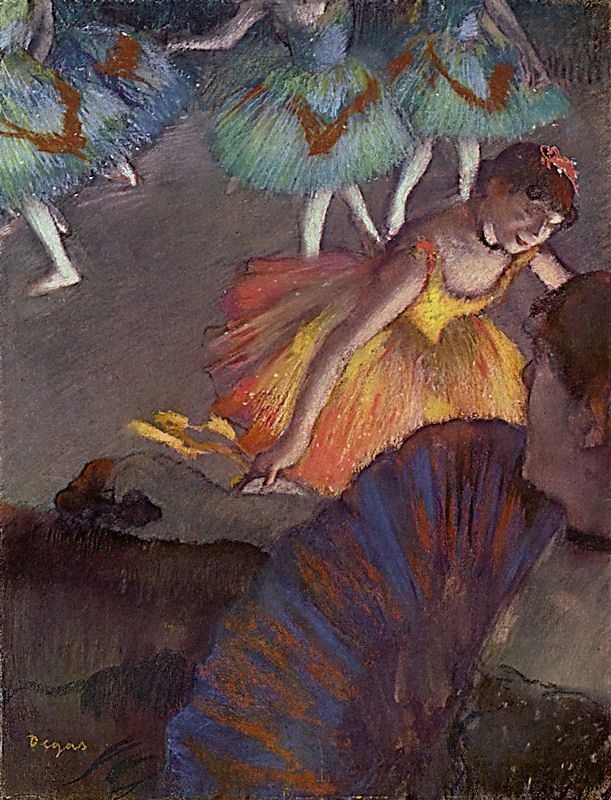 Indeed, it has been noted that the young girls have the snub noses and immature bodies of “Montmartre types”, the forerunners of the dancers Degas painted so often throughout his career. 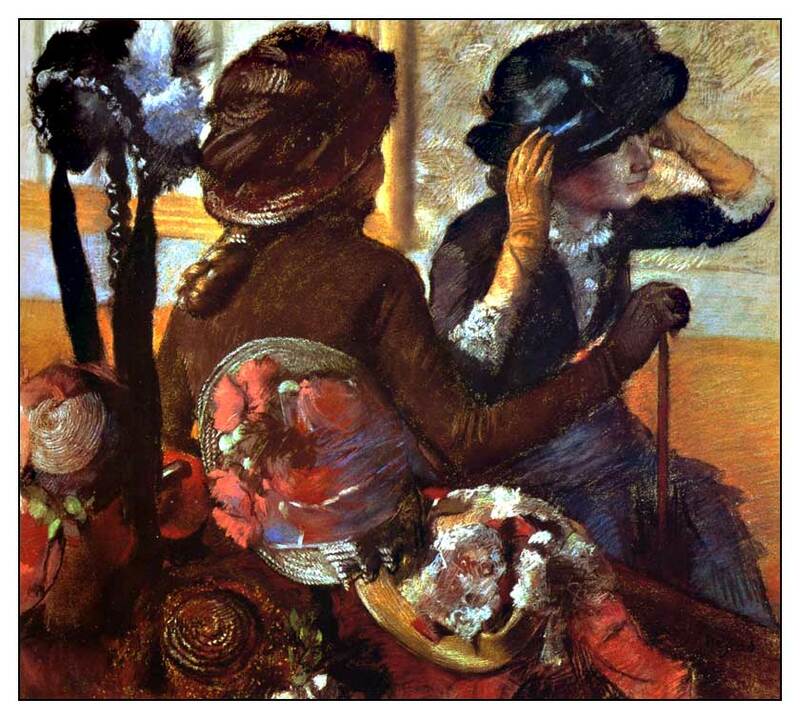 After 1865, when the Salon accepted his history painting The Misfortunes of the City of Orléans (Musée d’Orsay, Paris), Degas did not paint Academic subjects again, focusing his attention on scenes of modern life. 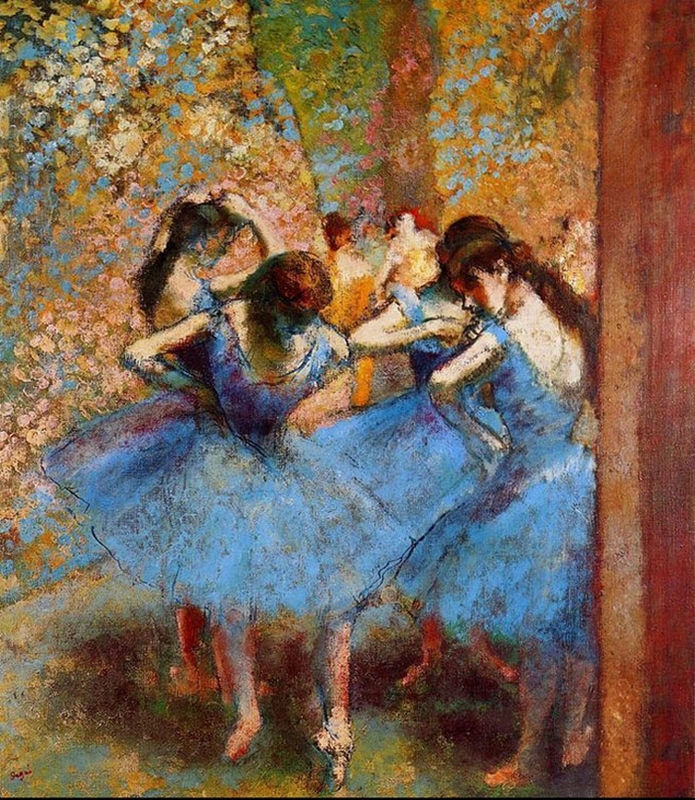 He began to paint scenes of such urban leisure activities as horse racing and, after about 1870, of café-concert singers and ballet dancers. 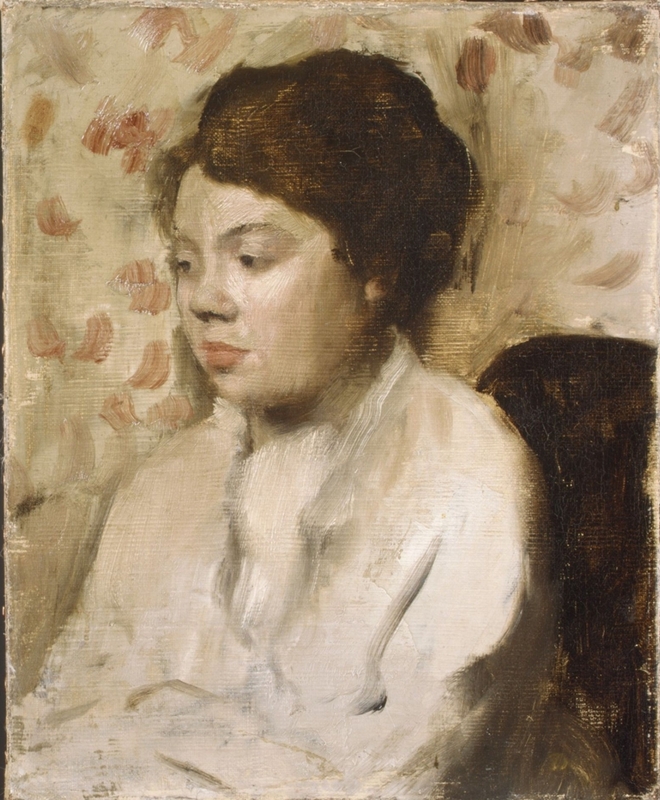 Degas’s choice of subject matter reflects his modern approach. 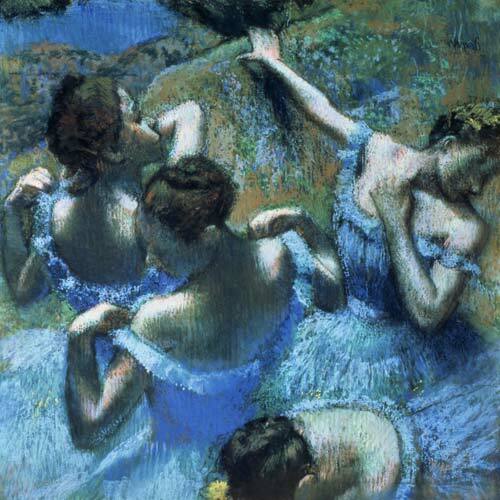 He favored scenes of ballet dancers, laundresses, milliners (At the Milliner’s, 1882), and denizens of Parisian low life. 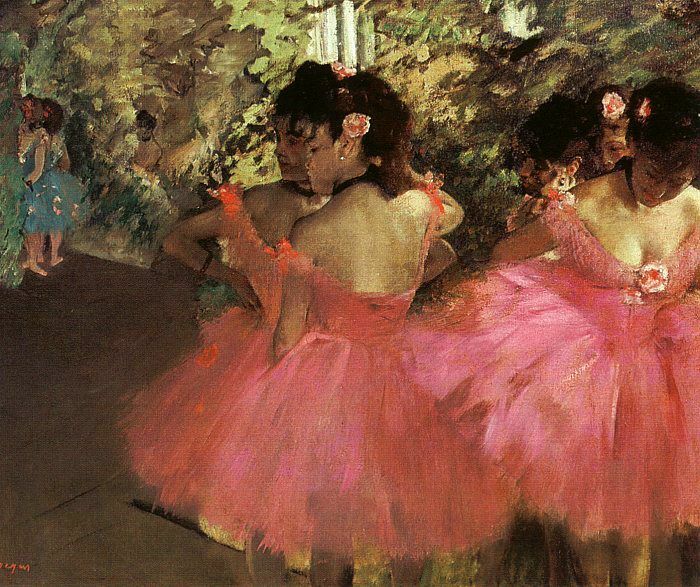 His interest in ballet dancers intensified in the 1870s, and eventually he produced approximately 1,500 works on the subject. 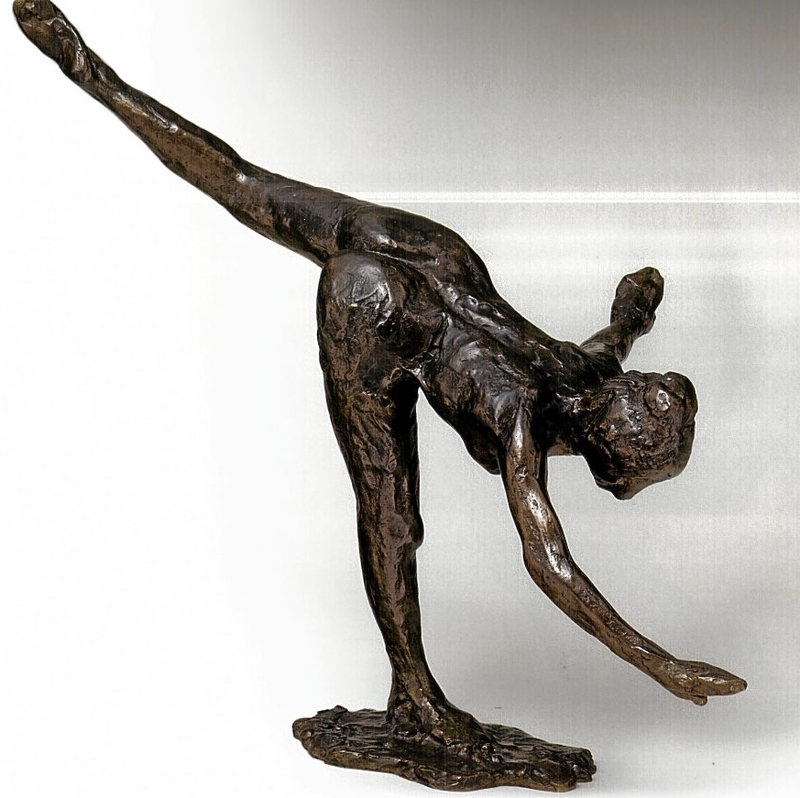 These are not traditional portraits, but studies that address the movement of the human body, exploring the physicality and discipline of the dancers through the use of contorted postures and unexpected vantage points. 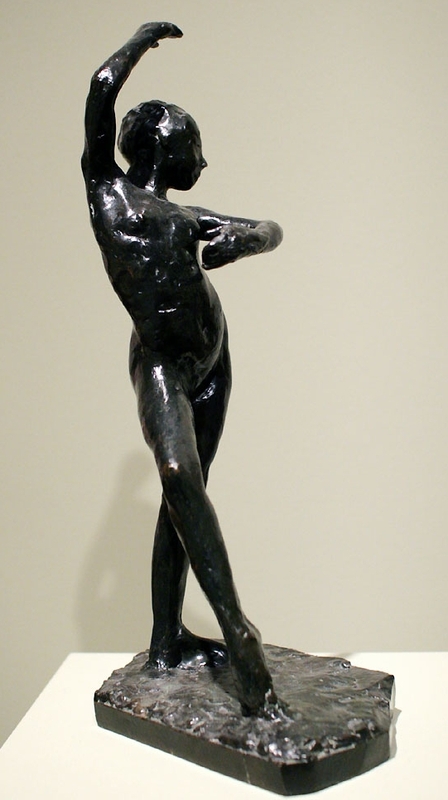 In Dancer Adjusting Her Slipper (1873), the figure’s pose is difficult to decipher, viewed from a steep angle with both her feet and her head at the bottom of the picture, yet it conveys a sense of the dancer’s flexibility. 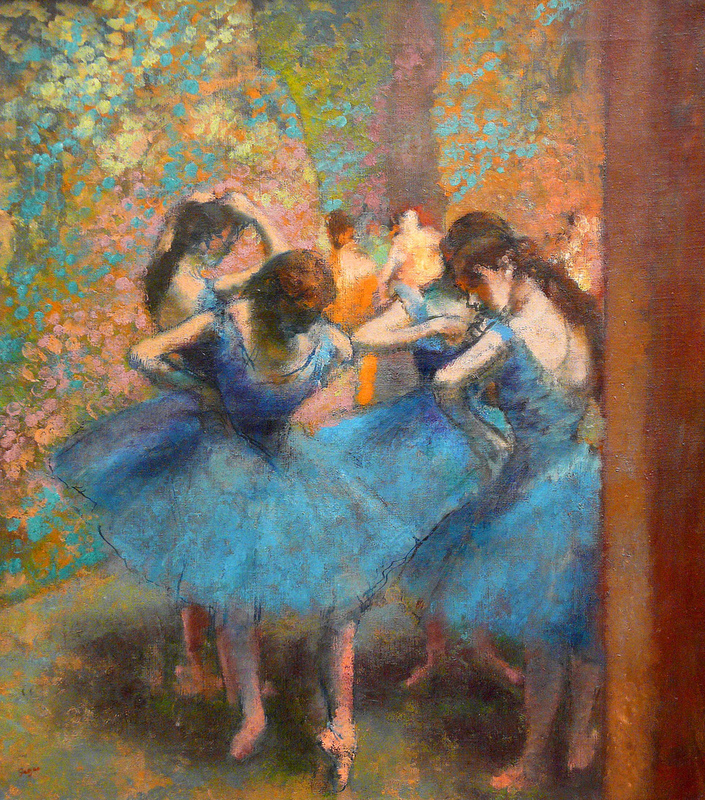 Degas absorbed artistic tradition and outside influences and reinterpreted them in innovative ways. 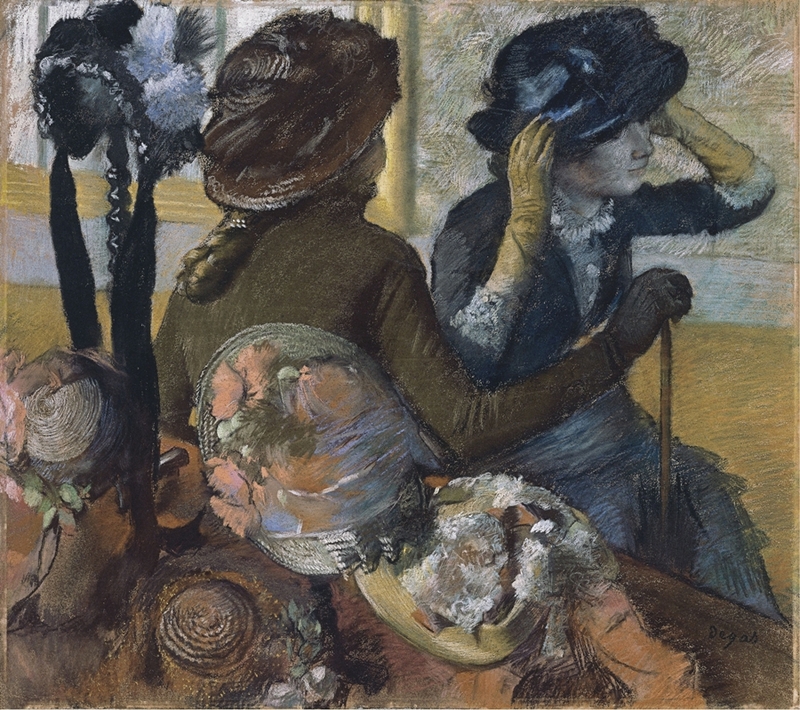 Following the opening of trade with Japan in 1854, many French artists, including Degas, were increasingly influenced by Japanese prints. 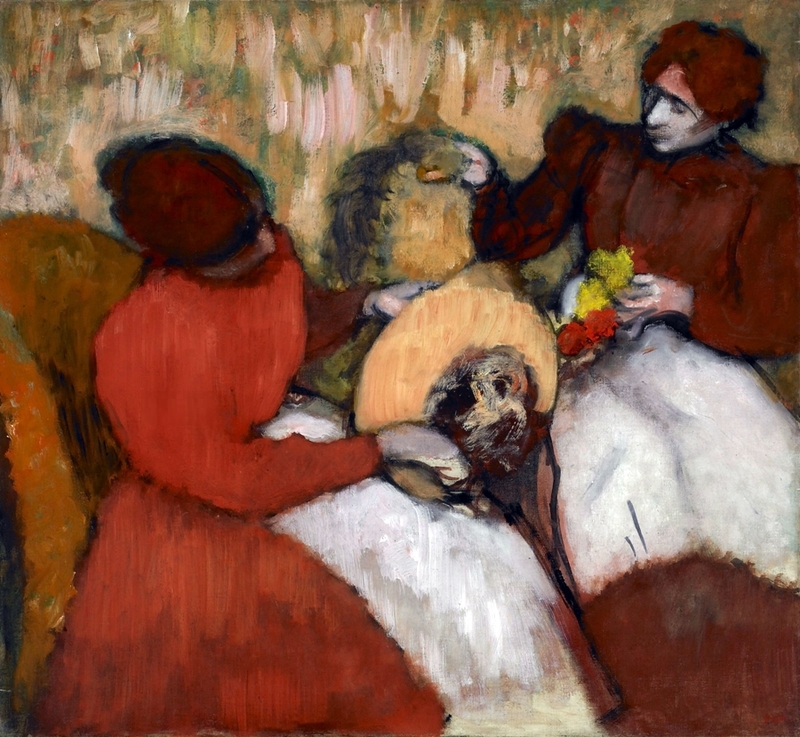 But whereas his contemporaries often infused their paintings with Eastern imagery, Degas abstracted from these prints their inventive compositions and points of view, particularly in his use of cropping and asymmetry. 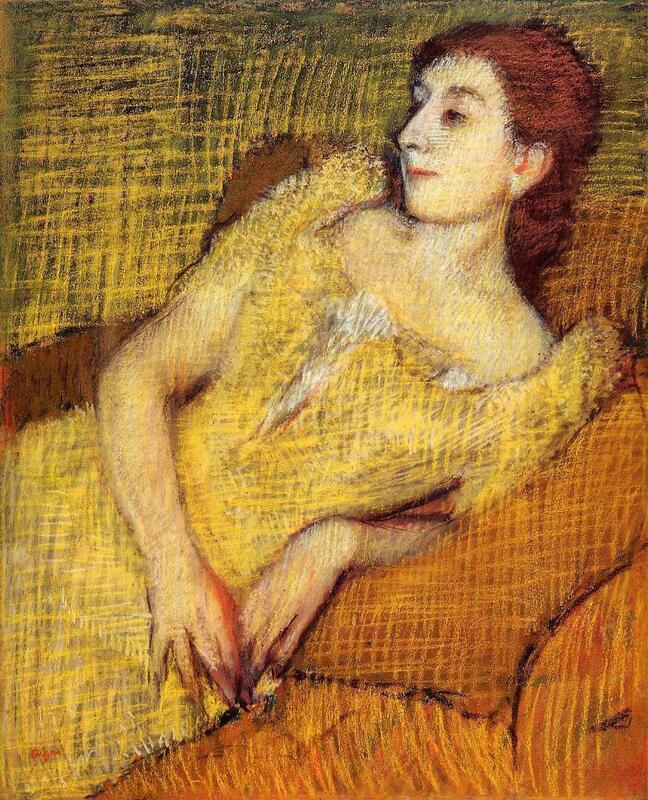 Degas had also observed how sixteenth-century Italian Mannerists similarly framed their subjects, sometimes cutting off part of a figure. 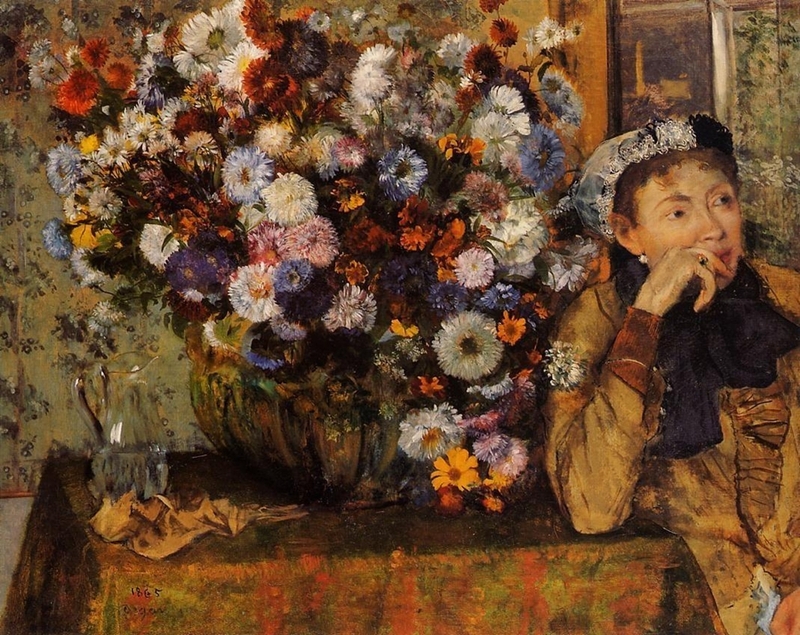 For example, in A Woman Seated Beside a Vase of Flowers (1865), the figure is cut off at the right edge of the painting, with part of her left hand just barely visible at the lower right corner. 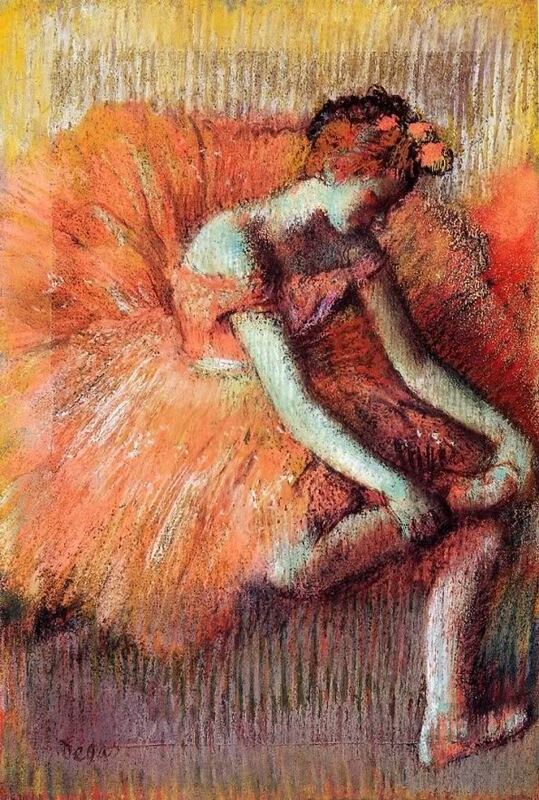 In her subdued attire she seems almost incidental to the riot of color that makes up the central floral arrangement. 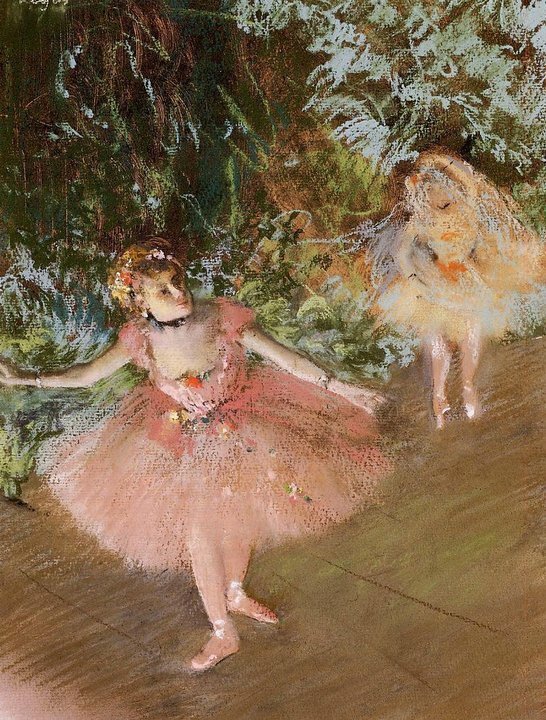 Unusual vantage points and asymmetrical framing are a consistent theme throughout Degas’s works, especially in his many paintings and pastels of ballet dancers, from the time of Dancers Practicing at the Bar (1877), through the decades until Dancers, Pink and Green (ca. 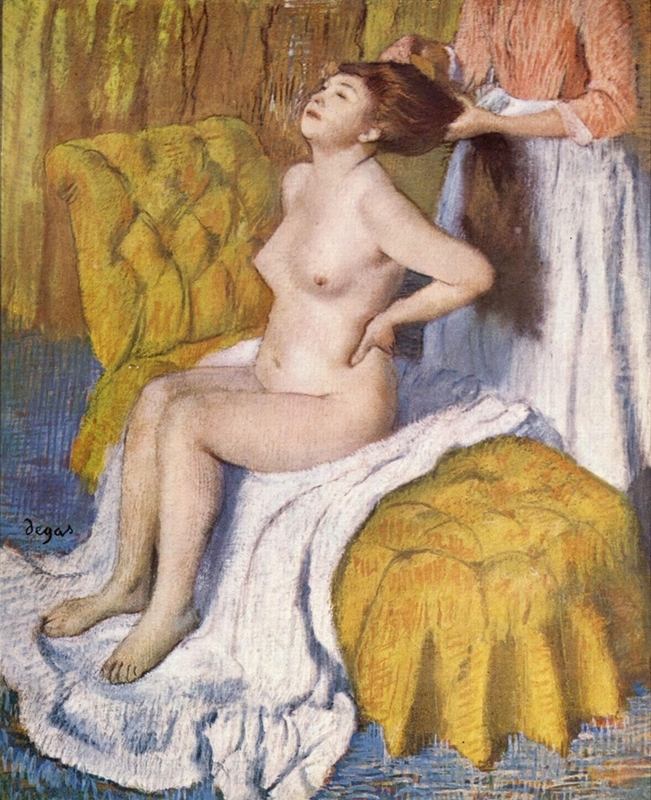 1890), and beyond. 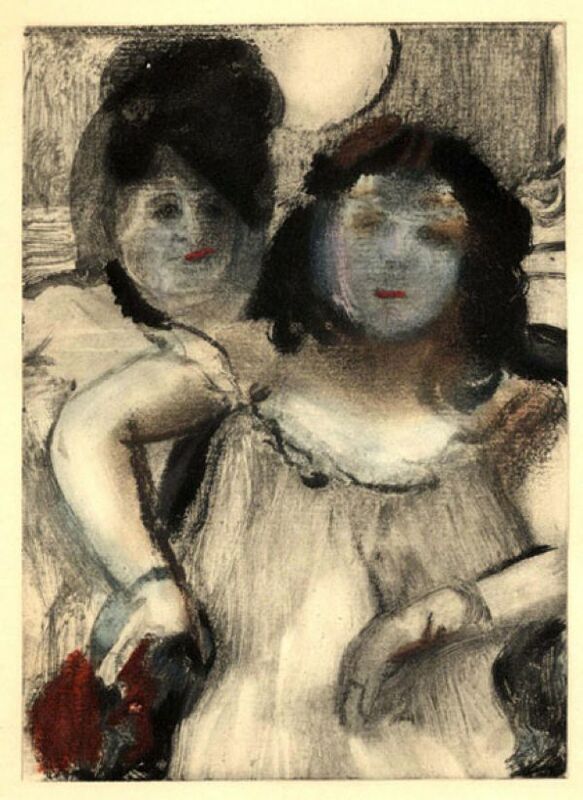 Even in a more traditional work of portraiture like the Duchessa di Montejasi with Her Daughters, Elena and Camilla (ca. 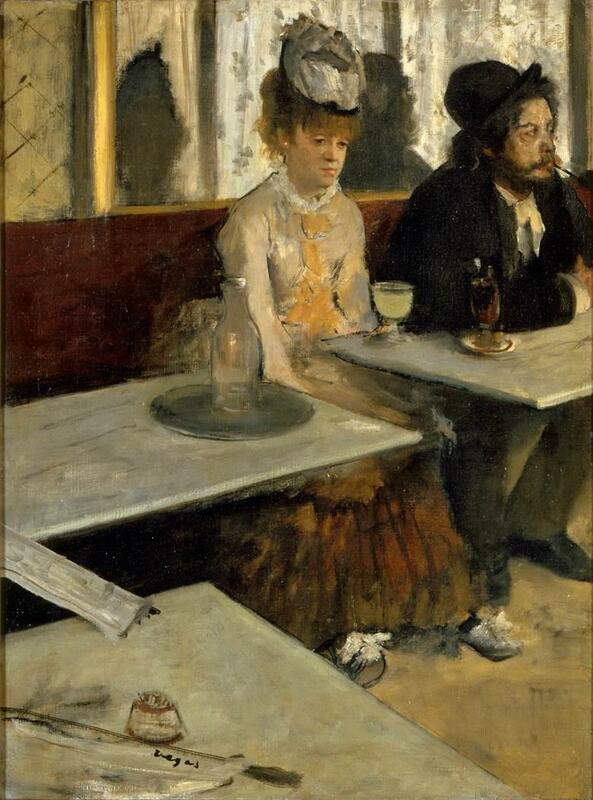 1876; Museum of Fine Arts, Boston), he achieves a more modern effect by disrupting the compositional balance. 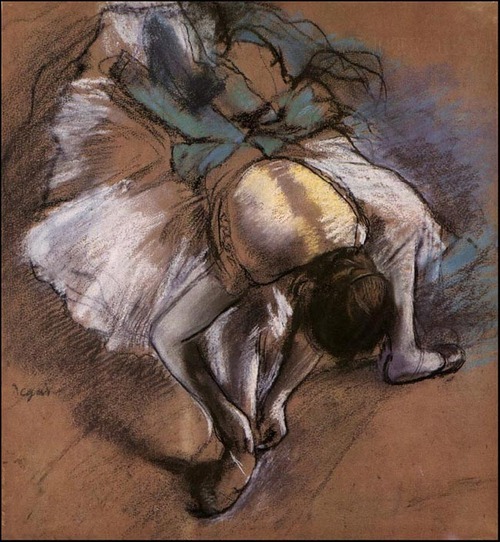 Degas had a lively, scientific interest in a wide range of media, including engraving, monotype, and photography. 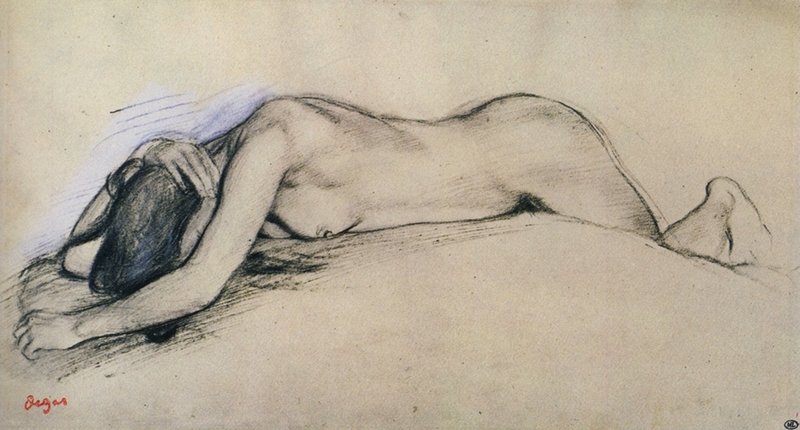 Before 1880, he generally used oils for his completed works, which were based on preliminary studies and sketches made in pencil or pastel. 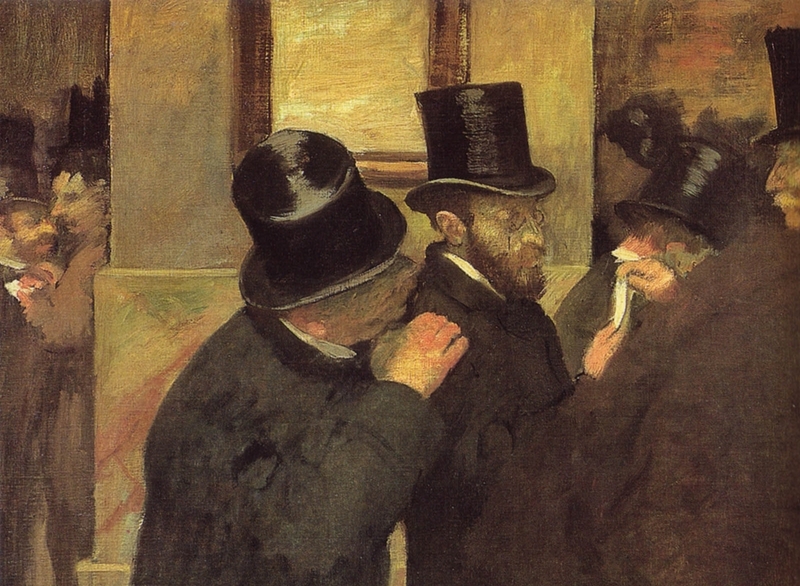 But after 1875, he began using pastels more frequently, even in finished works, such as Portraits at the Stock Exchange (1876), which displays a subtle grasp of the characteristic postures and attire of the top-hatted gentlemen he portrays. 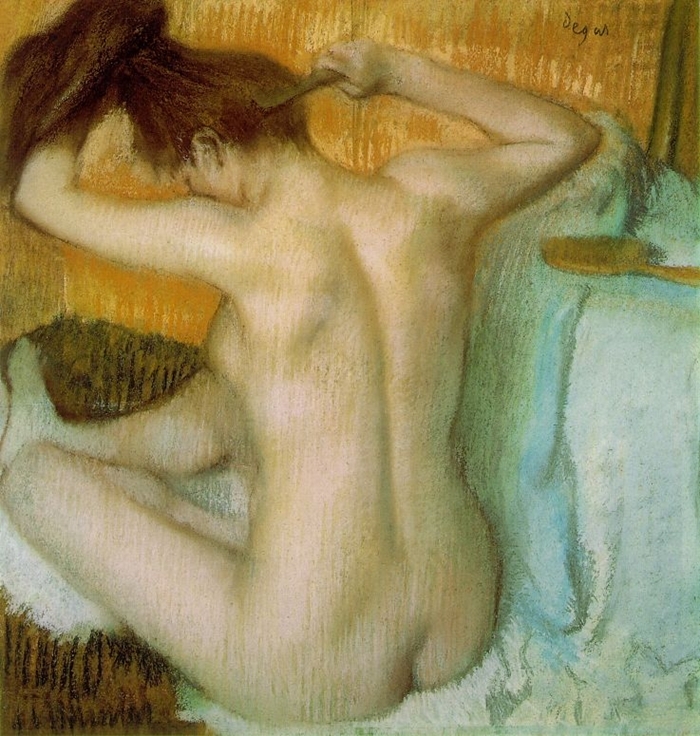 By 1885, most of his more important works were done in pastel. 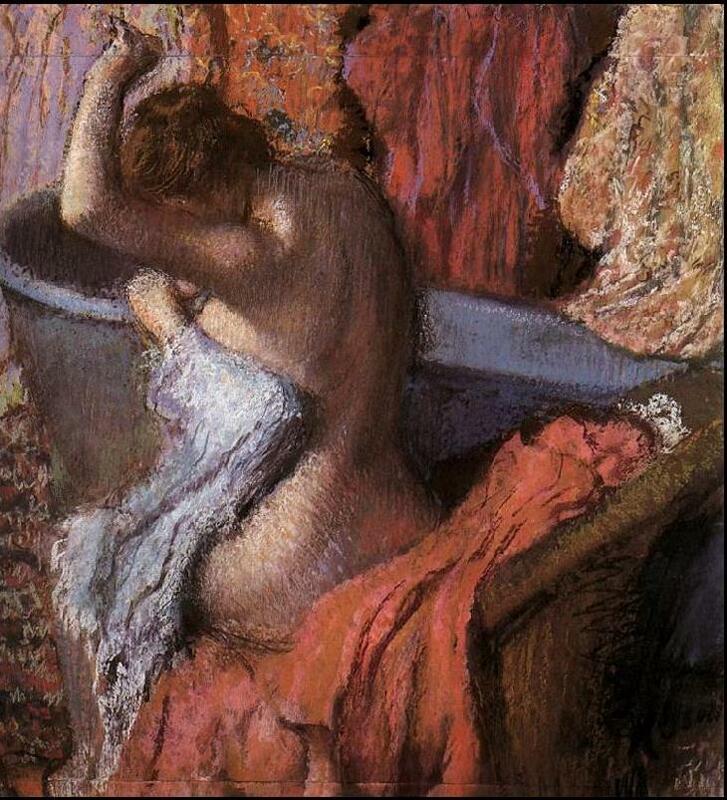 He submitted a suite of nudes, all rendered in pastel, to the final Impressionist exhibition in 1886; among these was Woman Bathing in a Shallow Tub (1885). 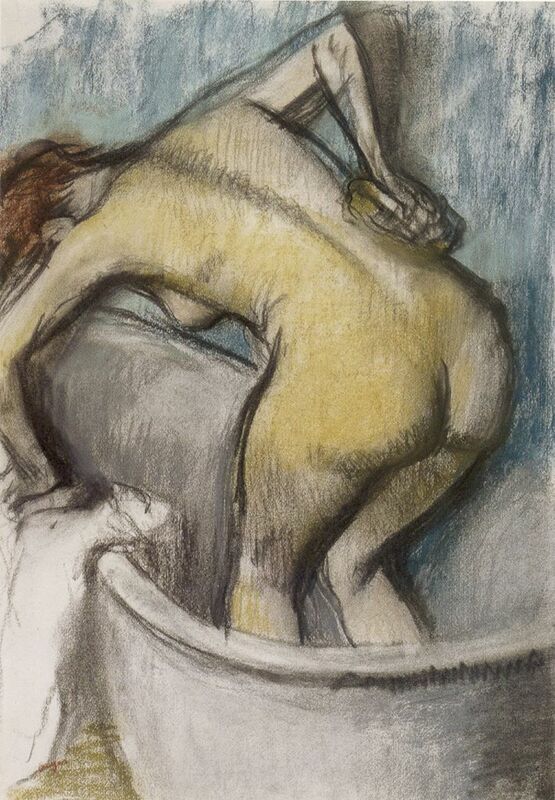 The figures in these pastels were criticized for their ungainly poses, as in this work, in which the figure squats awkwardly in a tub, yet the steep perspective gives the work a solid, sculptural balance. 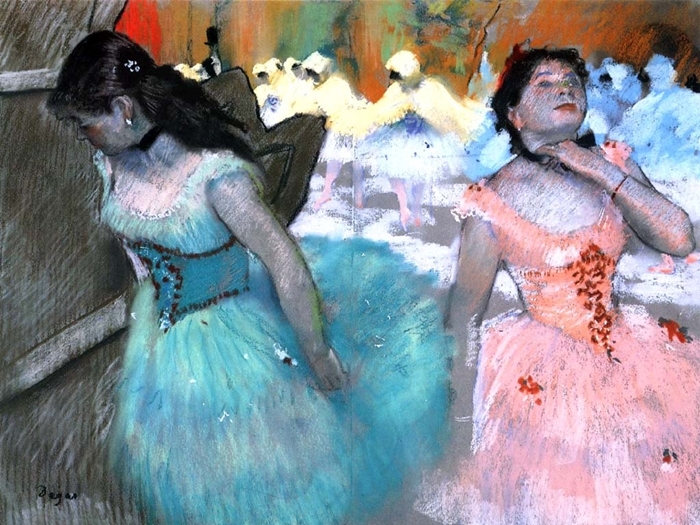 Degas experimented with an array of techniques, breaking up surface textures with hatching, contrasting dry pastel with wet, and using gouache and watercolors to soften the contours of his figures. 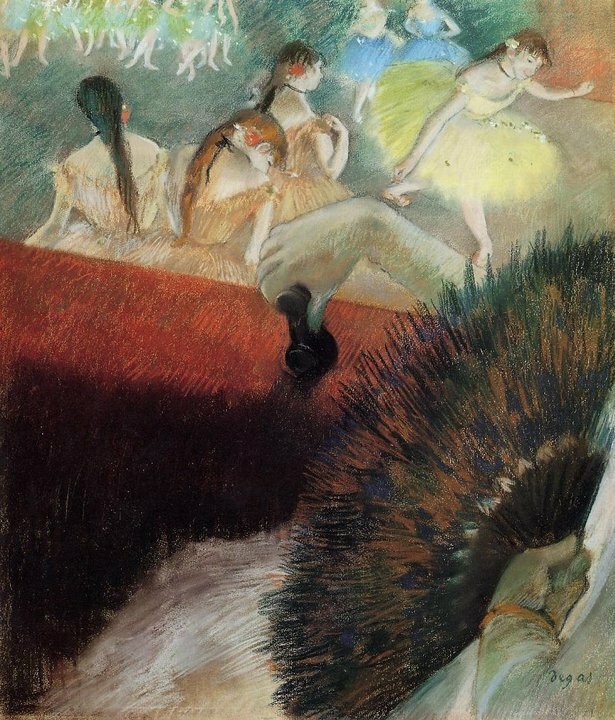 In Race Horses (1885-88), which depicts another of Degas’s favorite themes, the use of hatching gives a sense of swaying grass. 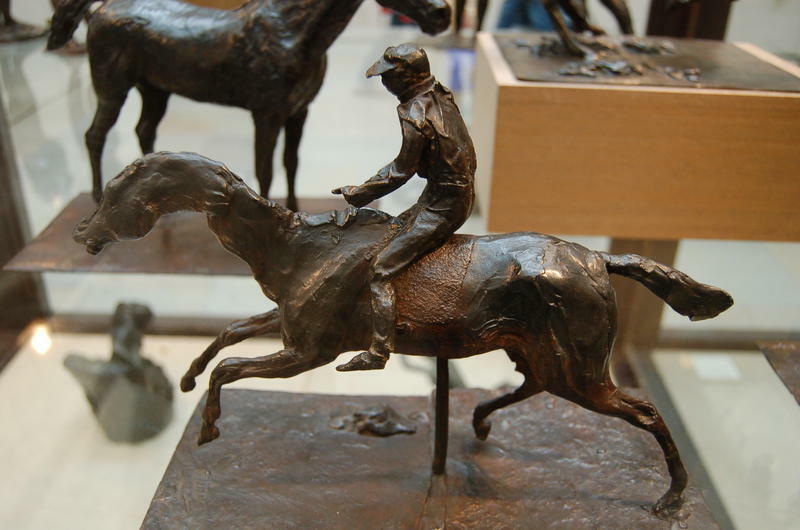 The immediacy of the moment is captured in the raised leg of the horse in the foreground and the foreshortened, angled approach of the vigorous horse in the background. 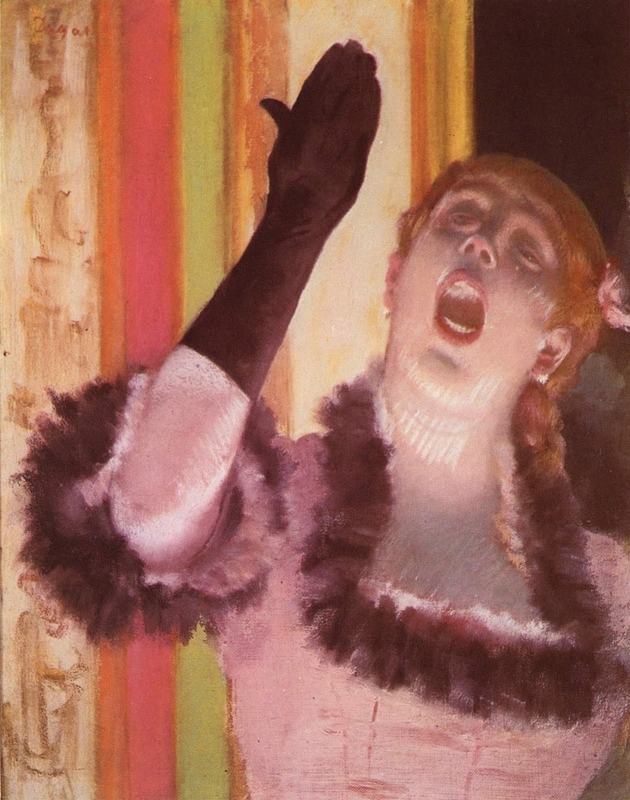 The Singer in Green (ca. 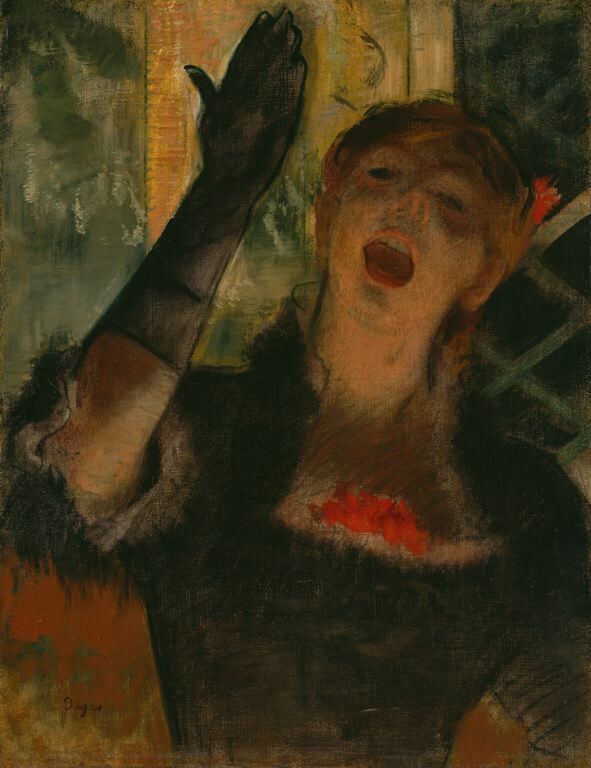 1884) demonstrates Degas’s use of pastel to achieve the effect of the glare of footlights illuminating his subject from below and his use of coarse hatching to suggest the curtained backdrop behind the singer. 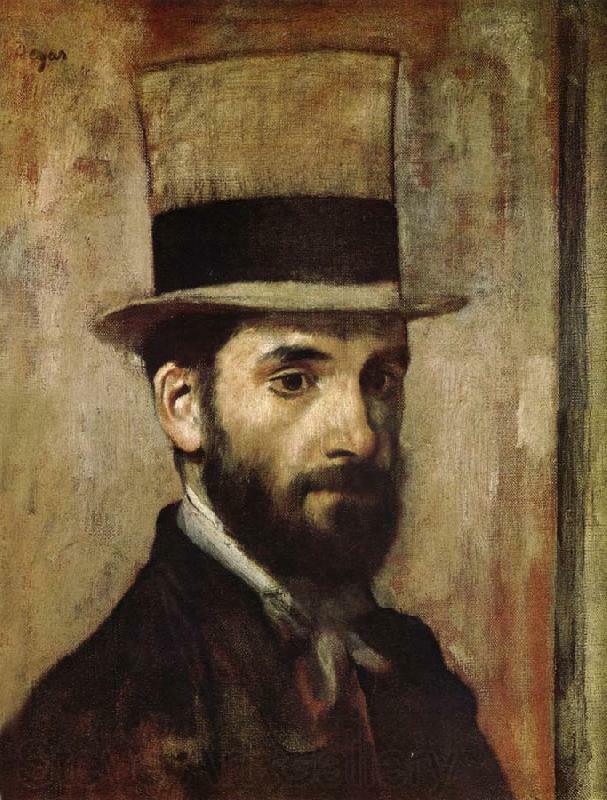 By the late 1880s, Degas’s eyesight had begun to fail, perhaps as a result of an injury suffered during his service in defending Paris during the Franco-Prussian War of 1870-71. 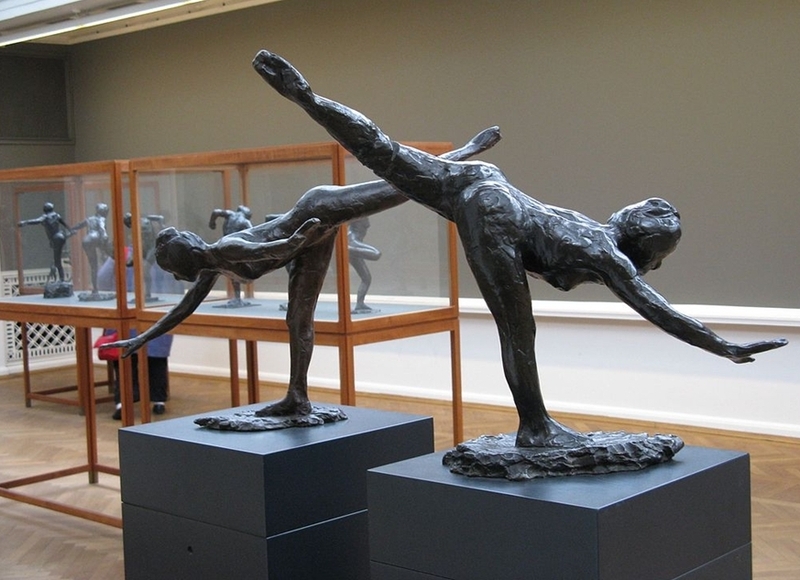 After that time he focused almost exclusively on dancers and nudes, increasingly turning to sculpture as his eyesight weakened. 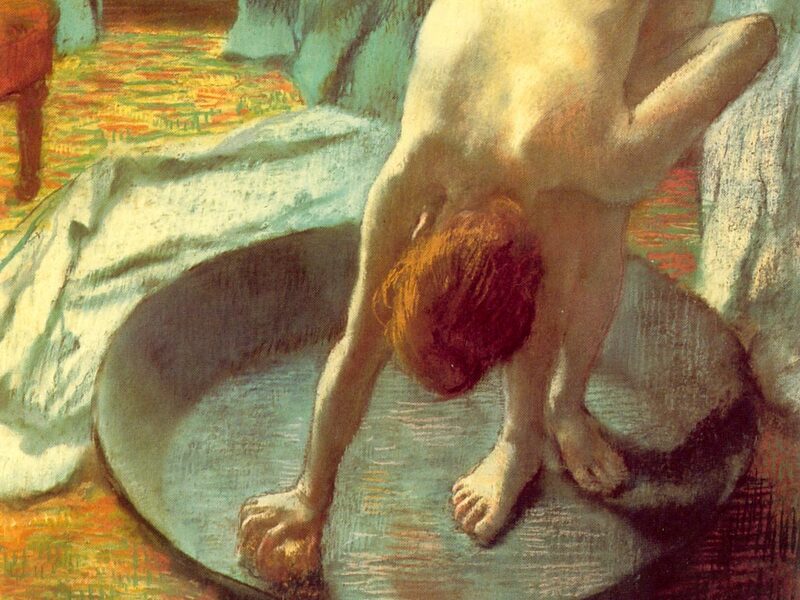 In his later years, he was concerned chiefly with showing women bathing, entirely without self-consciousness and emphatically not posed. 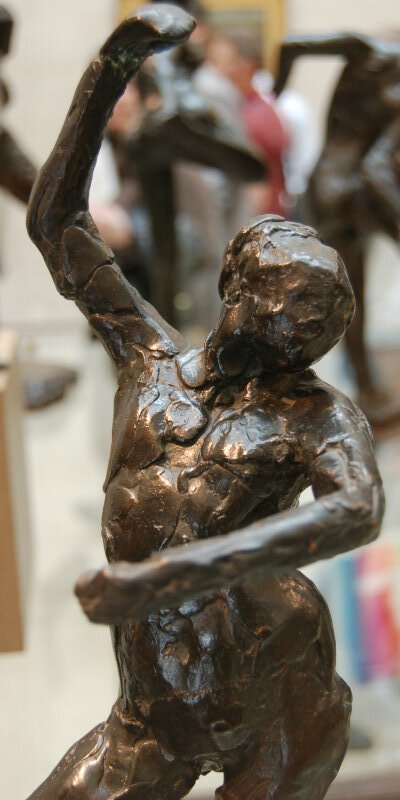 Despite the seemingly fleeting glimpses he portrayed, he achieved a solidity in his figures that is almost sculptural. 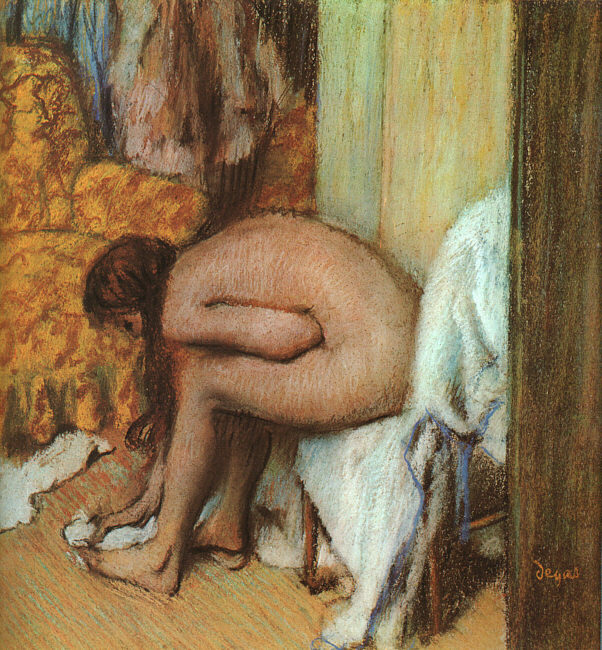 In later life, Degas became reclusive, morose, and given to bouts of depression, probably as a consequence of his increasing blindness. 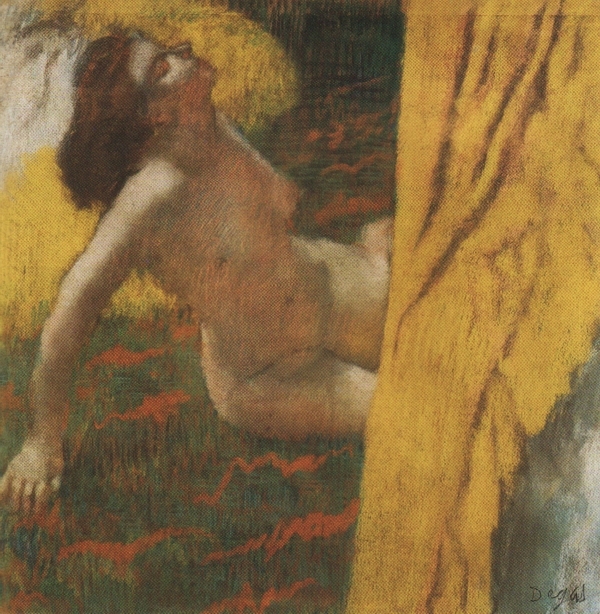 His monotype Landscape (1890-92), an unusual work from this period, is an unexpected instance of Degas presenting an outdoor scene with no figures, which shows an imaginative and expressive use of color and freedom of line that may have arisen, at least in part, as a result of his struggle to adapt to his deteriorating vision. 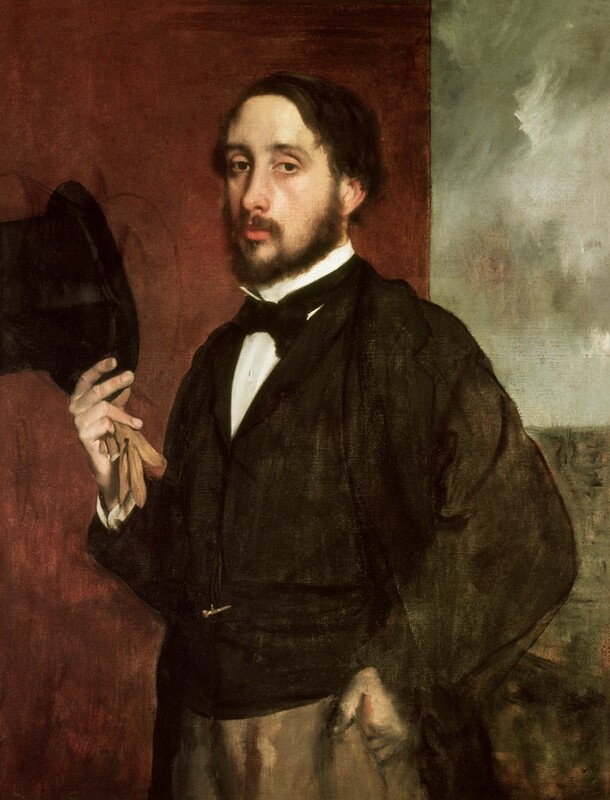 DEGAS, Hilaire-Germain-Edgar - Pittore, nato a Parigi il 19 luglio 1834, morto ivi il 26 settembre 1917. 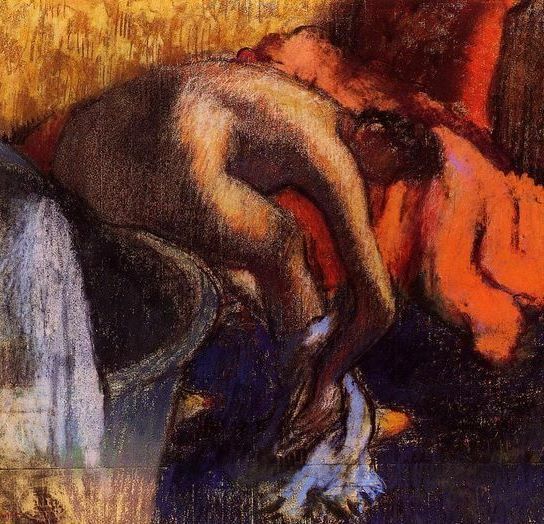 Di famiglia borghese, agiata e colta, fu allievo del Lamothe. 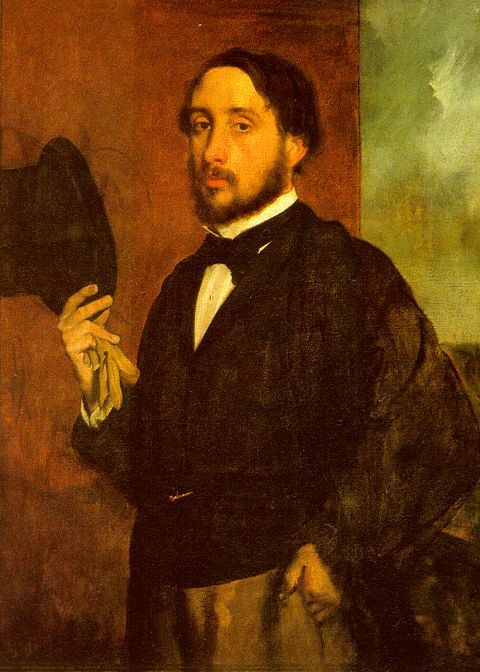 Concepì per l'Ingres un culto senza riserve, che conservò tutta la vita e che seppe accomunare a una profonda ammirazione per il Delacroix. 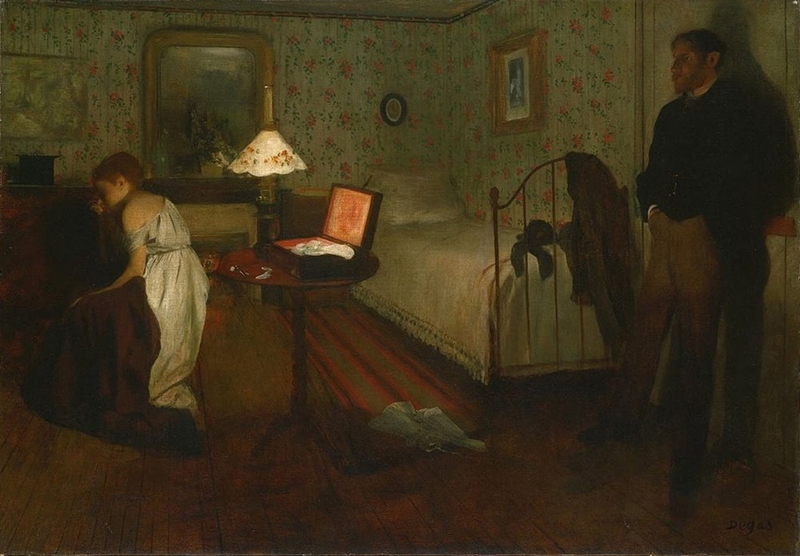 Un soggiorno a Roma nel 1856 lo mise in contatto con l'arte italiana. Soprattutto lo attrassero i pittori del '400, il Pisanello, i Pollaioli, il Mantegna, il Ghirlandaio. Si recò inoltre più volte a Napoli, dove eseguì alcuni ritratti. 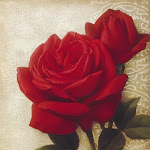 Ebbe pure occasione di passare qualche mese, presso un suo fratello, a New Orleans. 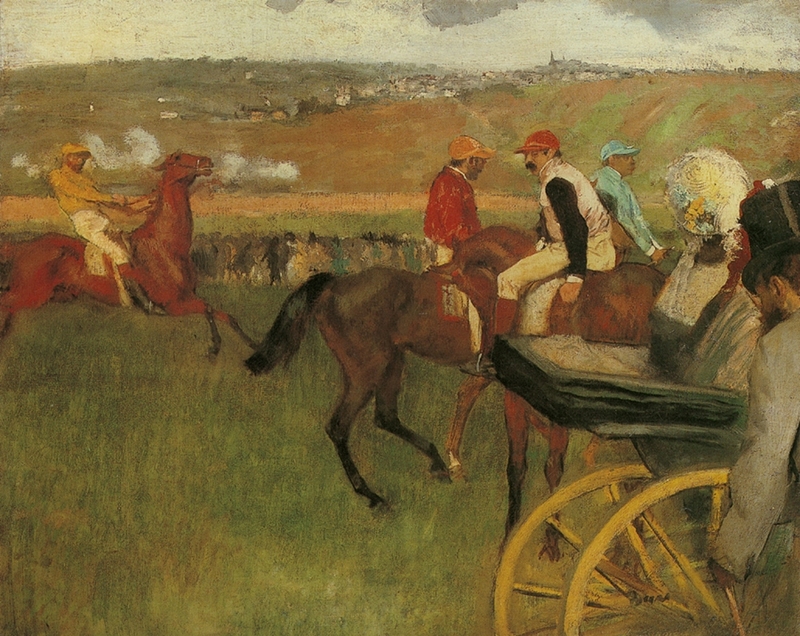 Le prime acqueforti del D. rimontano al 1857. 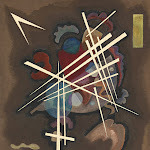 Verso la stessa epoca dipinge i suoi primi quadri, Alessandro e il Bucefalo, le Giovanette di Sparta (Londra, Tate Gallery), Semiramide, le Sciagure d'Orléans (Parigi, Museo del Lussemburgo), in cui si mescolano variamente gl'influssi dei due grandi maestri ammirati, l'Ingres e il Delacroix. 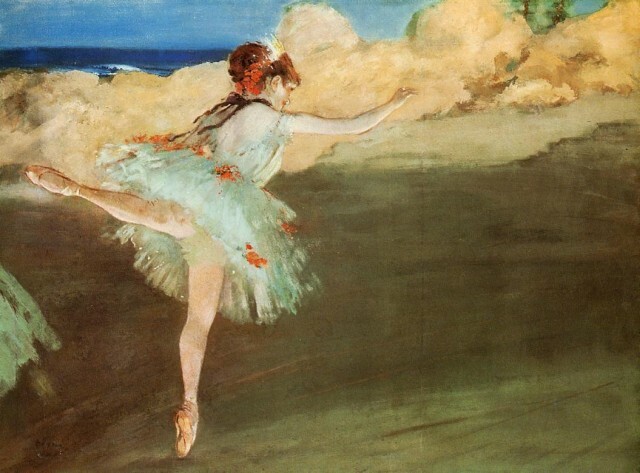 Il pregio di queste pitture consiste in una tonalità raffinata e squisita, in un voluto equilibrio di forme e in una meravigliosa finezza d'osservazione. 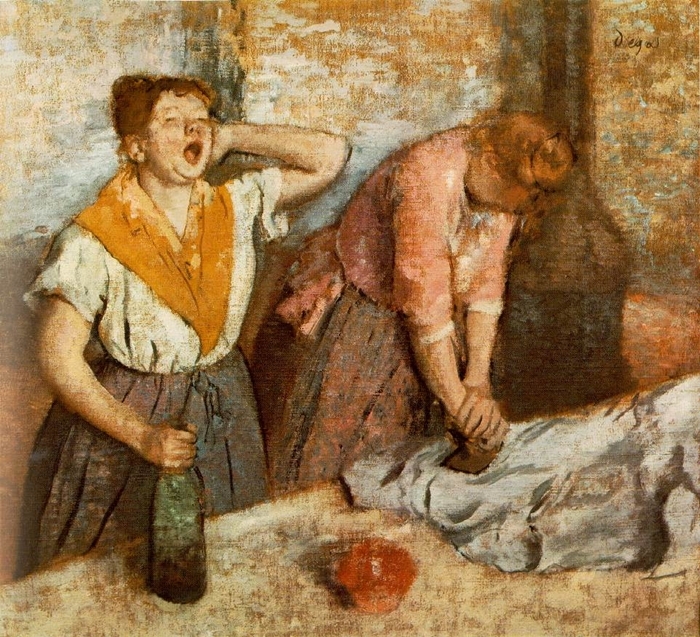 Frattanto, egli aveva già cominciata la serie dei ritratti, come Il ritratto di famiglia (1861) nel museo del Lussemburgo, che ha l'austerità e il ritmo monumentale d'un affresco. 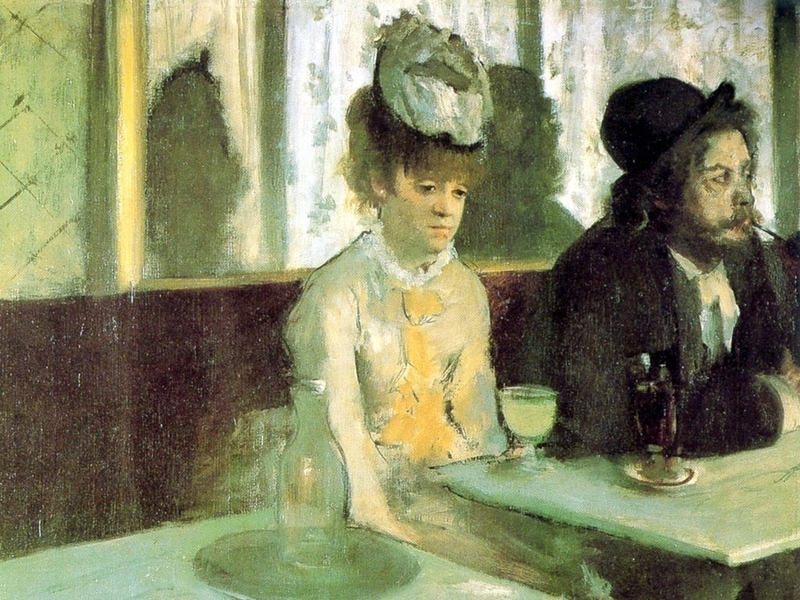 Verso il 1865 si legò al gruppo di artisti del caffè Guerbois, capitanati dal Manet, i quali iniziavano qllora la rivolta contro l'accademismo, esercitando un'influenza decisiva sul D. Egli continuò nondimeno a esporre regolarmente ai Salons dal 1865 al 1870. 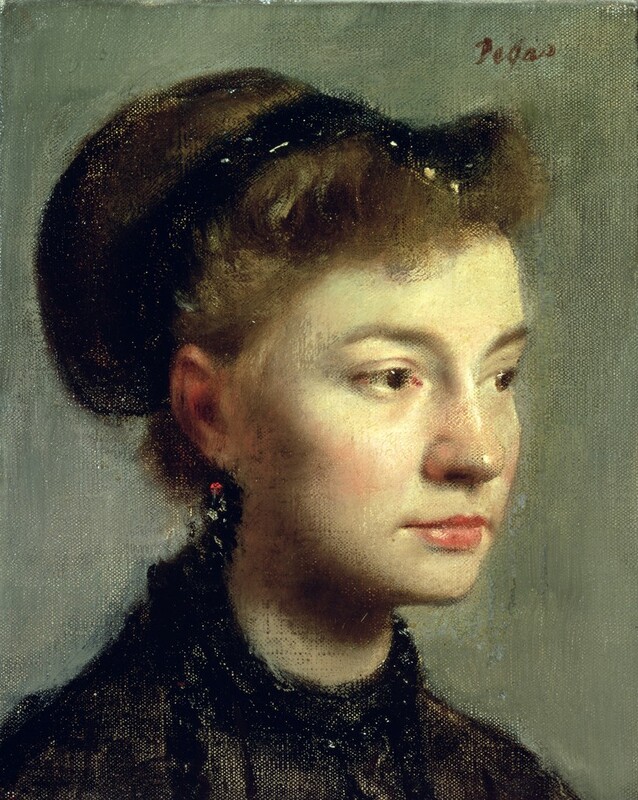 Sono di questo periodo alcune delle sue migliori opere: ritratto di M.me Gaujelin (La Femme aux mains Jointes, 1869, Boston, Gardner Museum), ritratto di M.me Camus (1870) e, soprattutto, l'Orchestra (1868) e il ritratto di M.lle Dihau (ambedue al Louvre), come pure la Donna con crisantemi e Ufficio dei cotoni a New Orleans (1873; Pau, Museo). 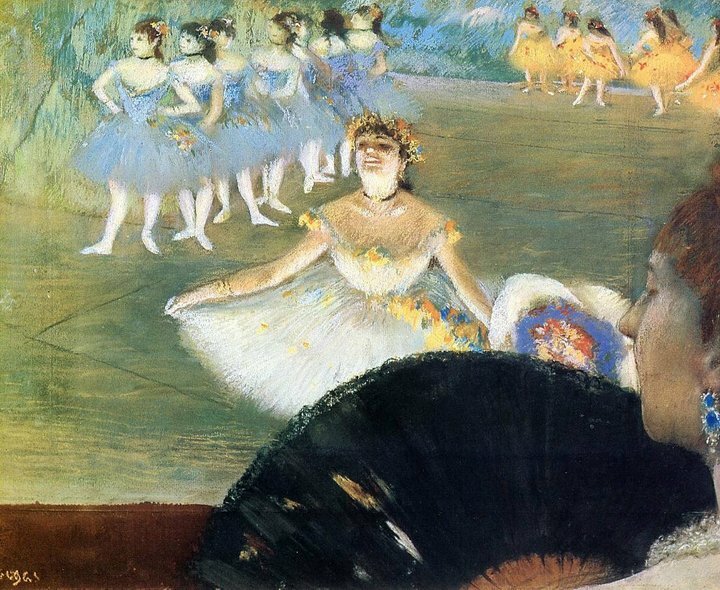 La battaglia contro i nuovi venuti imperversava: essi decisero allora di disertare le esposizioni ufficiali, ove erano ingiustamente boicottati, e di esporre a proprio rischio e pericolo. 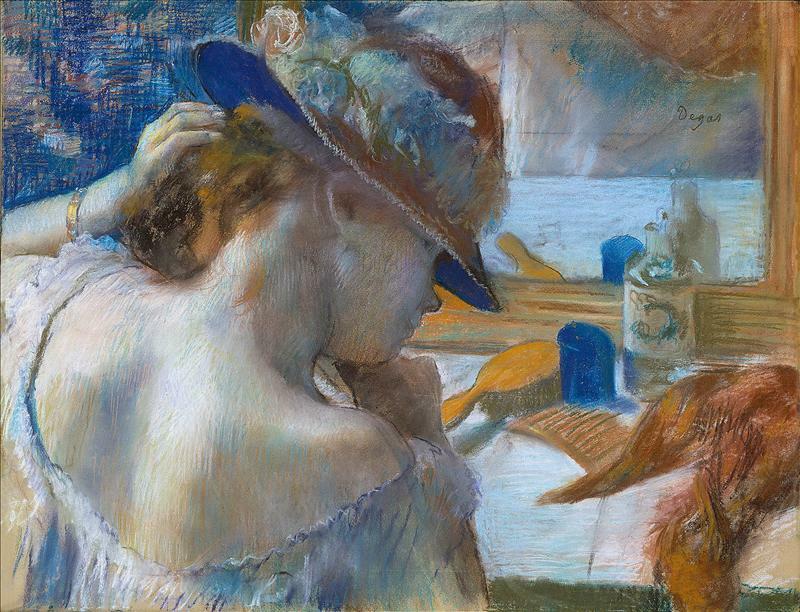 Così sorsero le famose esposizioni del gruppo "impressionista", etichetta che mal s'adattava a definire le tendenze di artisti molto diversi come Manet, Renoir, Monet, Cézanne, Pissarro, ecc., accomunati solo dal desiderio di spezzare le formule scolastiche e d'esprimere, ciascuno a suo modo, gli aspetti della realtà. 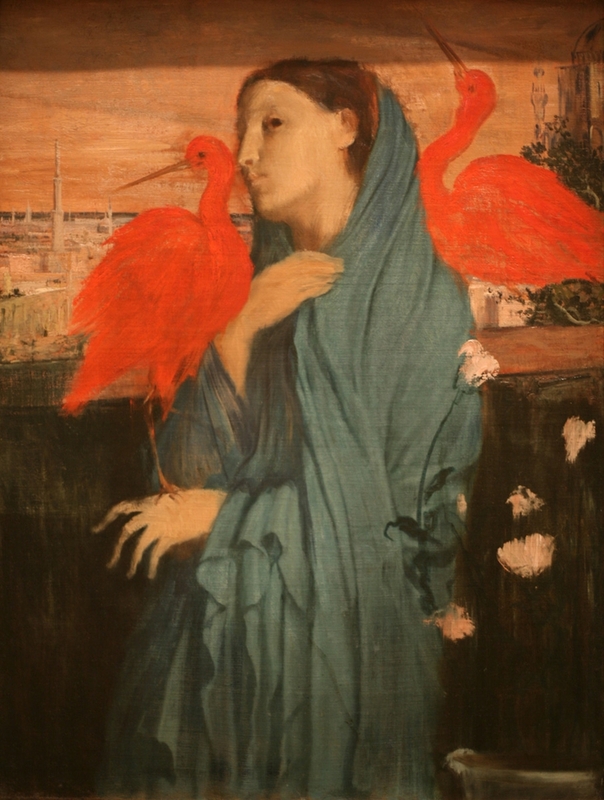 Nelle otto esposizioni che vanno dal 1874 al 1886, il D., sempre all'avanguardia, espone un centinaio di studî e di quadri. 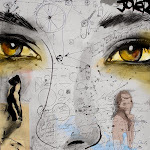 Si fece notare come un capo del gruppo, come il più fertile inventore di nuove espressioni pittoriche. 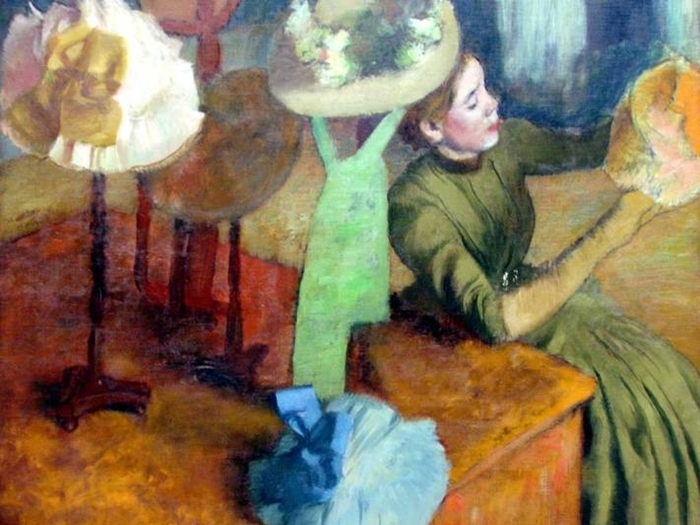 Per suo couto, non adottò mai la divisa della scuola du plein air; al contrario, i suoi soggetti sono composti, nella maggior parte, d'interni, spesso illuminati da luci artificiali. 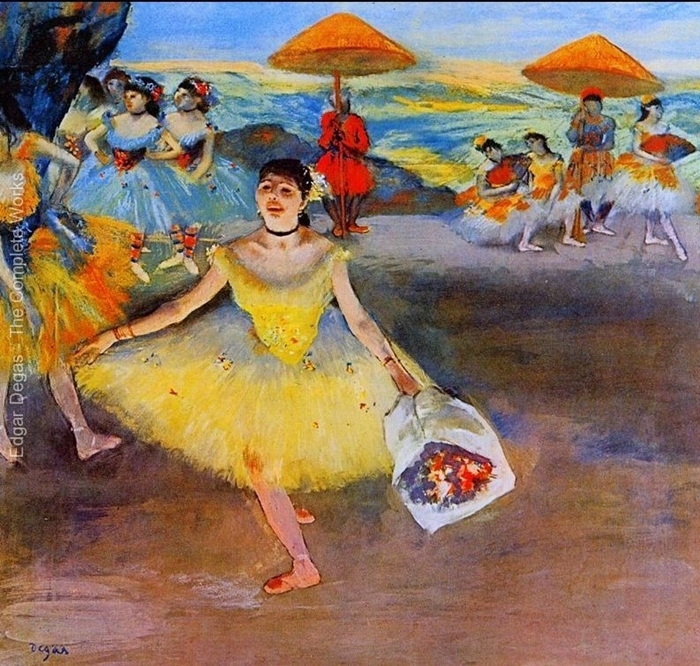 Questo parigino, amico del teatro, del circo, dei campi di corse e soprattutto del ridotto dell'Opéra, mise tutta la sua cura nel rappresentare visioni piccanti, inattese, della vita di Parigi. Per rompere con la retorica della scuola, per distruggere le convenzioni banali, egli predilesse per partito preso gli scorci arbitrarî, che accentuò mediante l'illuminazione a gas, i lumi delle ribalte e i lampioni multicolori; e i suoi quadri di Ballerine (a partire dal 1872), di Jockeys, più tardi di Modiste e di Lavandaie (verso il 1880) lo fecero apparire un rivoluzionario. 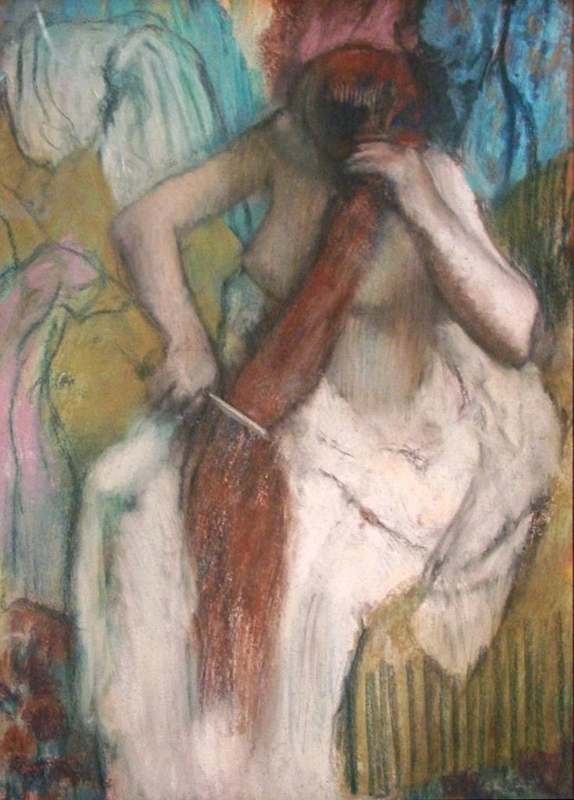 Nello stesso tempo egli si compiaceva di rinnovare lo schema compositivo del ritratto aggiungendo alla figura la resa dell'ambiente, come nei ritratti del barone Lepic (1872), di Duranty (1878) e nei Ritratti alla Borsa, Ritratti sulla scena, ecc. 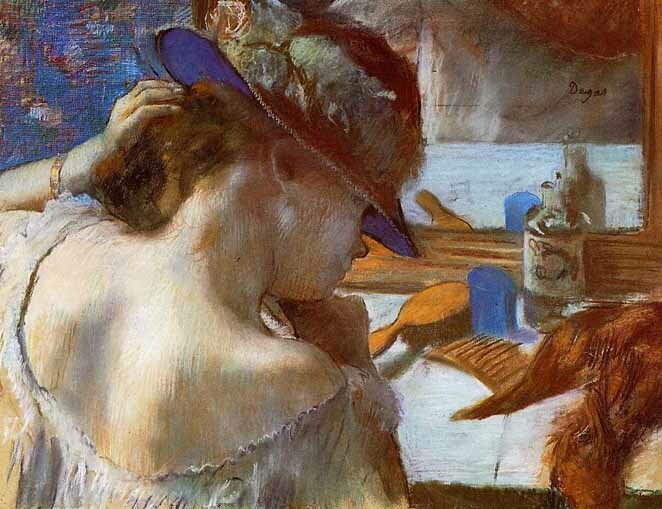 In realtà, con questa incomparabile serie di saggi egli perseguiva un'opera che non ha eguali nella storia dell'arte dopo quella delle botteghe fiorentine del Quattrocento: si trattava di rifare sulla natura e con l'osservazione dal vero tutto il linguaggio e il vocabolario dell'arte, di sorprendere la vita in atto, di liberarsi infine dai metodi e dai modelli di studio con una concezione nuovissima della forma, del movimento e dei valori plastici. 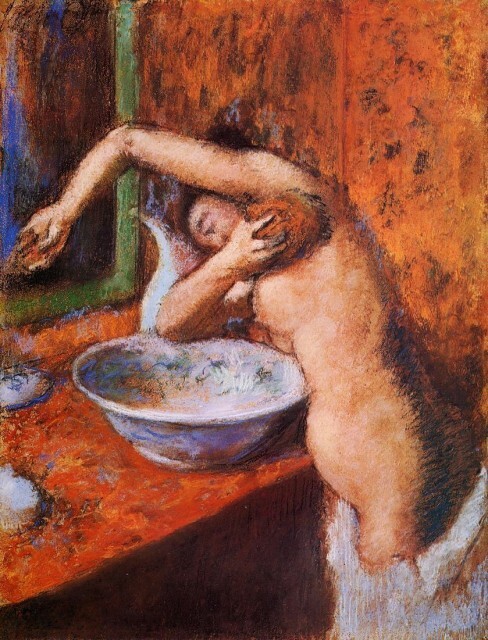 Ciò è palese soprattutto nella Suite de nuds (sic) de femmes se baignant, se lavant, se séchant, s'essuyant, se peignant ou se faisant peigner, serie che cominciò verso il 1886 e proseguì durante vent'anni: il grande artista consacrò le ultime sue forze all'eterno soggetto dell'arte, la conoscenza del corpo umano. 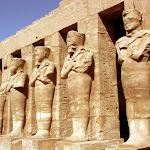 Questi studî sono quasi tutti fatti a pastello, in uno stile tumultuoso, grandioso, sempre più monumentale. 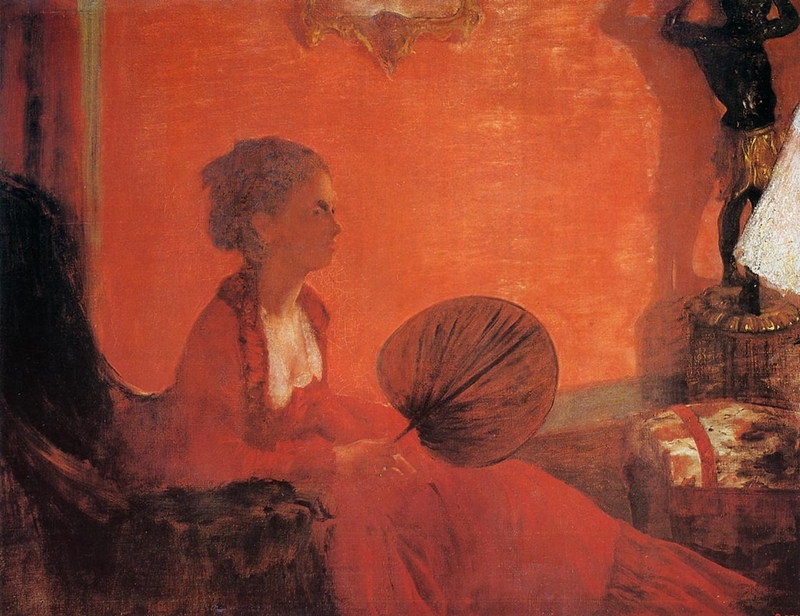 Ma perché ogni quadro riprodotto non è accompagnato dal titolo, dall'anno e dal luogo in cui si trova?